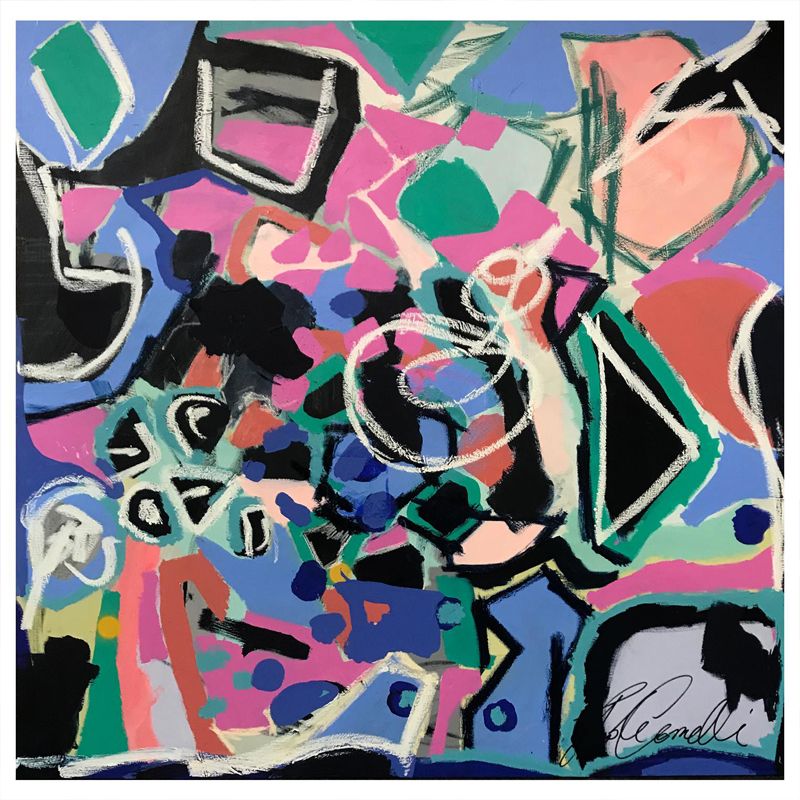 Nicole Baker advises that, collectors should ‘invest with their eyes’ and collect original artwork that visually appeals to them. Art collecting does not have to be a pursuit separate from interior design. It makes sense to invest in artworks which bring immediate joy. Much of the value of art and pleasure of collecting can be found in the way it transforms a room and engages all those who enter. Artwork can add a unique touch – an expression of your taste and personality. A prominently hung original artwork can lift a room to a new level. 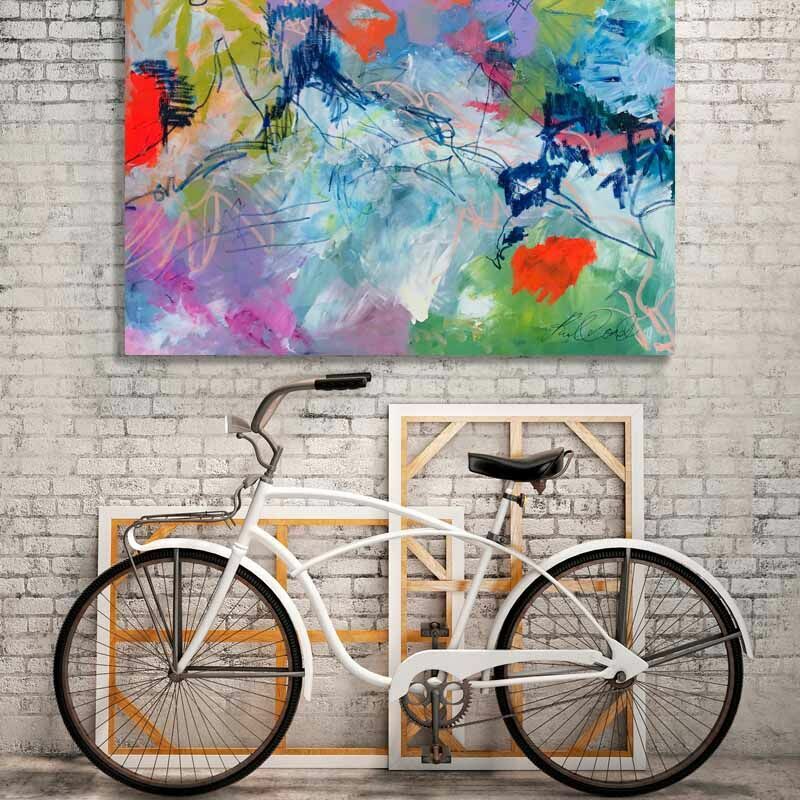 Oh La Laaaaa by Nicole Baker is one such a bold and versatile piece, which will make a striking addition to any space. Oh La Laaaaa is painted in Nicole Baker’s signature style of confident and textured brush strokes. It is at once simple and complex. The piece has been finished in a mix of fluid and textured acrylics on stretched cotton canvas, which can be hung with or without a frame. The colour palette of Oh La Laaaaa has an air of influential international style. Pale mauves contrast with salmon, punctuated by navy and black. A rich interplay of negative and positive space is created through blocks of dark, bright and pastel colour. Flat areas of colour are broken up with wide staccato lines, which create a feeling of spontaneity and energy. There is a dynamism to the piece as finer lines zig zag and traverse the canvas. Whilst peach and pink moments scattered over the surface bring unity and rhythm. The unconventional palette and variety of marks create a visually engaging canvas which the eye darts back and forth over. This combination of colour and rhythm lends itself to being placed in a variety interior, and it offers the opportunity for a playful or sophisticated design response. You will find that Oh La Laaaaa can accentuate a strong contemporary interior, or equally be at home in contrast to a more traditional setting. 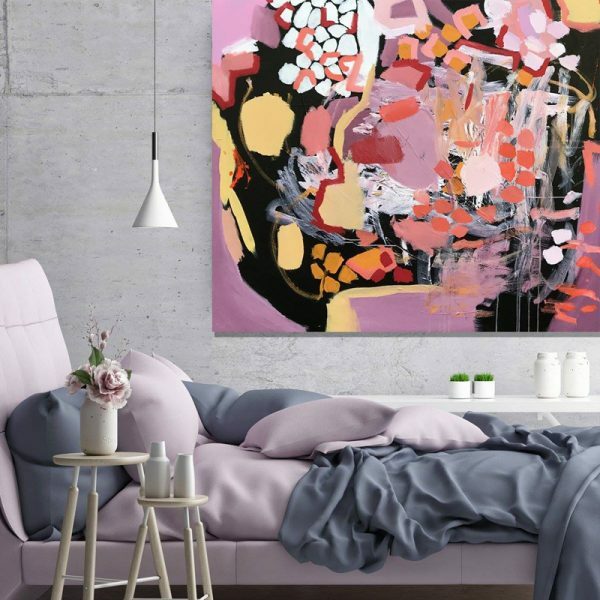 Consider it placed in an understated minimal bedroom where changes of linen can pick up different colours from the painting – from bold to subtle. In a living room, you could pair it with peach, pink and navy soft furnishings to create a vibrant casual ambience of relaxation, where conversation flows. Don’t be afraid of placing Oh La Laaaaa on a dark feature wall. The colours will pop and create drama. Try to imagine a daring choice of heavy ornate gold leaf frame, strong black timber furniture, and bold solid colour vases. Nicole Baker’s original works are sought after and hang in homes across Australia. Her work is collected by those who resonate with her distinctive style and fresh graphic approach. You can see her work given pride of position on a clean white wall, as well as positioned in eclectic homes nestled amongst a variety of textures and colours. Nicole paints for the pure love of painting and creation. She strongly believes that collectors should select pieces which speak to them personally. The artwork in situ should transform a house into a home. It should be work which shows off their personality and communicates to all who enter their space. Artwork can express the elegance, vision or bravery of a collector. 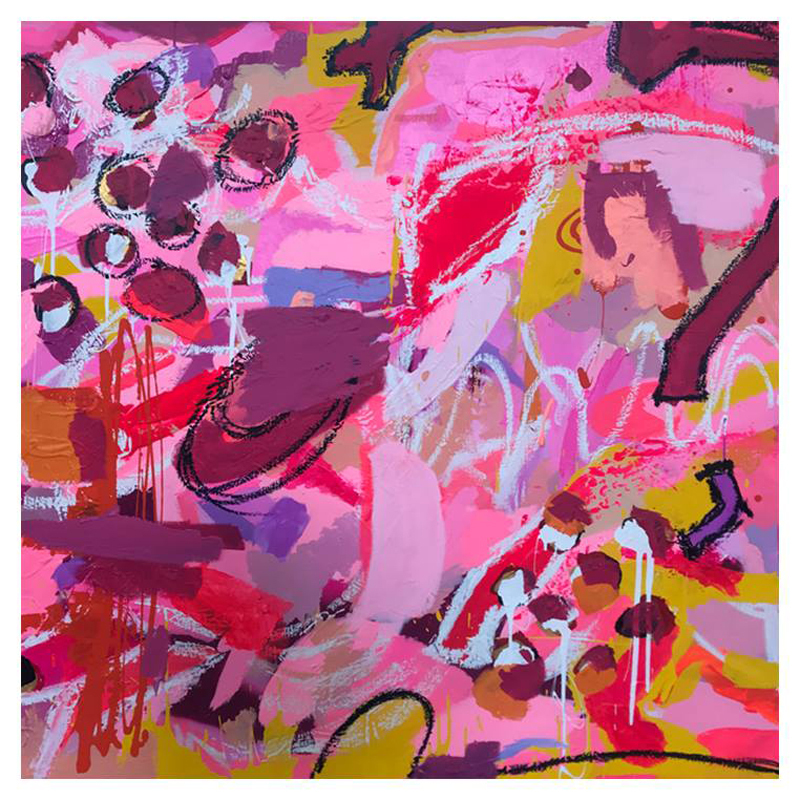 Oh La Laaaaa (120 x 120cm), Nicole Baker. Original abstract acrylic on stretched cotton canvas.